The Atlona AT-UHD-HDVS-300-C-KIT provides a complete integration solution for huddle spaces and meeting rooms using PC-based conferencing codecs such as Skype® for Business, WebEx®, and GoToMeeting®. It includes AV switching, USB and HDMI extension, and integrated system control, plus the AT-HDVS-CAM, an enterprise- grade PTZ camera. The switcher and extender system offers five video inputs for HDMI, DisplayPort, and analog video signals. To simplify conference room device management, the system provides two USB type B connectors for host computers. Two built-in USB hubs, one on the transmitter and one on the receiver, allow for numerous Human Interface Devices (HID), as well as USB microphones and speakerphones plus the HDVS-CAM. For the HDMI inputs, the HDVS-300-C-KIT is compatible with sources and displays up to 4K/UHD @ 60 Hz with 4:2:0 color subsampling. Audio, video, data, control, USB, and Ethernet transmission is carried over a single, Ethernet-enabled HDBaseT link up to 330 feet (100 meters). Simple meetings demand simple systems. Attendees want to walk into a meeting space, open their laptop, and start a cloud-based conference. But to get quality results, systems are designed with AV extenders, USB extenders, USB hubs, remote controls, cameras, microphones and all the associated cable runs. The HDVS- 300-C-KIT was designed to eliminate the clutter and system complexity in huddle spaces and meeting rooms where USB cameras and microphones are incorporated into professional AV systems with just two devices and a single category cable. 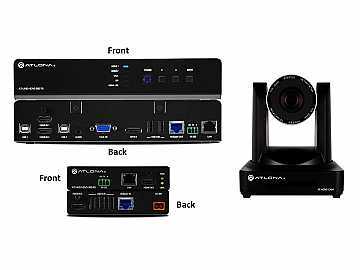 This kit also excels in hybrid rooms where a traditional HDVS system is required for in- person meetings as well as videoconferencing. The HDVS-300-C-KIT provides control to a display through TCP/IP, RS-232, or CEC*, without the need for a separate control system. This simplifies system design and integration while reducing costs. With automatic display control, the HDVS-300-C- KIT can trigger a display to power on automatically whenever a laptop or other device is connected. At the end of the presentation, when the presenter disconnects the laptop, the HDVS-300-C-KIT forces the display to power off. Ease of presenter interaction with the system, and the savings incurred by automatic display shutdown provide a significant return on investment. The HDVS-300-C-KIT display control capability can also be triggered by an external control system. The HDVS-300-C-KIT automatically selects an input source based on detection of the 5 volt hot plug detect (HPD) signal, as well as active video. This ensures reliable auto-switching operation for all video sources, including DVRs, DisplayPort / Mini DisplayPort adapters, and other devices that always maintain the HPD line at the 5 volt “high” state but may not be delivering active video. The Atlona Management System (AMS) is a powerful network software platform ideal for configuring, managing, and monitoring the HDVS-300-C-KIT and other Atlona IP-controllable devices over a LAN, WAN, or VPN. AMS is available free from Atlona, and greatly streamlines installation and maintenance of several Atlona products throughout a facility or enterprise, from a standard web browser.